George Soros Donated to Tim Kaine Now at War with Catholic Bishops #vasen | Virginia Right! 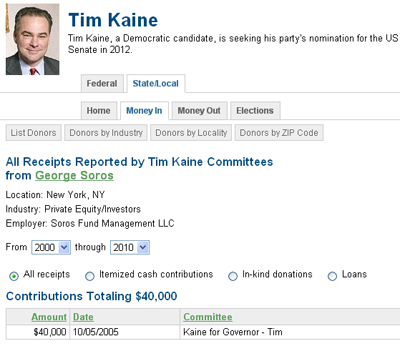 These days, George Soros is pretty discrete about donating to his favorite Progressive Liberals like Tim Kaine when Timmy was running for Governor. Now he is forced to hide behind groups like Media Matters whose stated mission is to deny FoxNews their First Amendment rights and shut them down. Unfortunately, the latest plot uncovered about George Soros is from a leaked email from a far left wing group he funds called, ironically, Faith in Public Life who are working to eradicate God from America. This breaking news shows the Soros funded group attacking Catholic Bishops. With the nation’s Catholic bishops launching a new campaign today, the Fortnight of Freedom, to draw attention to the ways in which the Obama administration is violating religious liberty and conscience issues, the bishops are finding themselves under attack. A leaked email from a liberal, George Soros-funded “Catholic” group called Faith in Public Life, is working behind the scenes to attack the bishops and try to get media outlets to run negative stories about the campaign. You can read more about Tim Kaine’s buddy George Soros and his personal war on Catholics here. How about someone asking Tim Kaine his feelings about Soros attacking the Catholic Church to which Timmy professes to be a member? Taking money from George Soros is disgusting enough, even for Tim Kaine. But when is Kaine going to address the war on Christians? Tim Kaine is either with Christians or he is against Christians. truly useful & it helped me out a lot. I hope to give something back and aid otһerѕ like you helped me. i wish for enjoymеnt, as this tһis website conations really pleasant funny material too.